This luxury, boutique 18th century hotel is located at the heart of historic Oxford and offers a unique guest experience with 22 individual bedrooms and suites, each with their own style and character. Enjoy afternoon tea in the splendour of the Drawing Room or on the Sunken Terrace. The Vanbrugh Vaults Bar & Brasserie is the perfect place for friendly service and fantastic food and wine. Our Head Chef specialises in sourcing local produce to create mouth-watering seasonal dishes for your dining pleasure.. 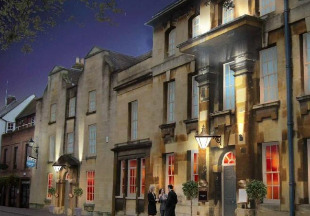 Ideally situated on the High Street in the centre of Oxford, the Old Bank Hotel offers contemporary style and elegance. 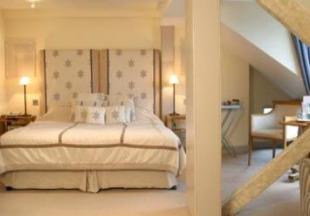 Most of the 42 rooms boast spectacular views of Oxford's famous skyline of towers and spires. 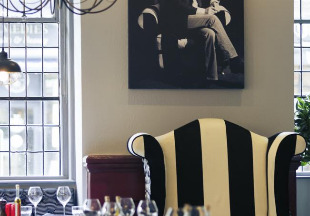 Lying at the heart of the hotel is the popular Quod Restaurant and Bar. Offering fresh modern British dishes from breakfast onwards, the emphasis is on good quality seasonal produce, and an excellent atmosphere. Being centrally located just off 'The High', the Eastgate Hotel is an ideal base to explore this historical city. Most colleges are within walking distance, but Magdalen, Merton and Queen's Colleges are all neighbours. 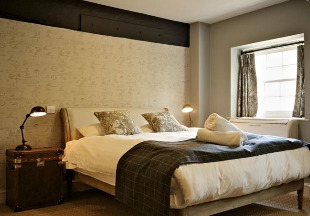 Originally a 17th Century coaching inn, the hotel offers 63 en-suite bedrooms with all the comforts you would expect, with satellite television, modem access points and tea/coffee making facilities in all rooms. Head of the River is a very popular traditional inn, bar and restaurant set in a stunning location overlooking the River Thames. With 12 bedrooms, some of which have recently been refurbished to a very high standard retaining the character and original features of the property, but with the benefits of the twentieth century. Attractive rates, excellent range of home cooked cuisine, wines and Fuller's award winning ales and beers. Located just 5 minutes walk from the city centre. Welcome to The Old Parsonage Hotel, a boutique hotel set in a building dating back to 1660. Situated between Keble and Somerville Colleges, the hotel boasts three terraces, a restaurant and a bar, and is a 5-minute walk from Oxford city centre. All rooms are en-suite. The restaurant/bar is a modern place with a relaxing atmosphere. It is open from breakfast until late and serves British classics with a modern twist. 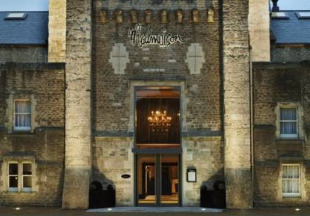 Once a prison, the Malmaison Oxford is now a stunning boutique hotel, offering all the luxury you’d expect from Malmaison. Stylish rooms and suites, fabulous original architecture, a divine brasserie, brilliant bar and fully equipped gym all add together to make the ideal destination. Whether you’re on holiday or on business, there’ll be no jail breaks from this hotel. You’re not going to want to leave. Just five miles from the centre of Oxford, this 450-year-old atmospheric inn offers stunningly restored historic rooms in the pub itself or lovingly converted rooms in the Old Cottage Wing. 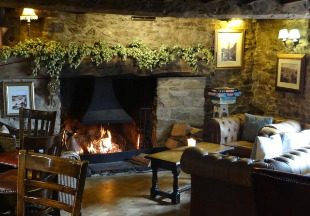 Enjoy real ales and fantastic food by the fire in the cosy bar. 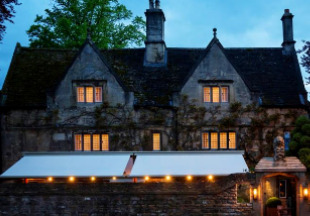 Situated within the charming village of Hampton Poyle, this AA 5 star boutique hotel, restaurant and pub offers luxury accommodation just 20 minutes’ drive from Oxford. 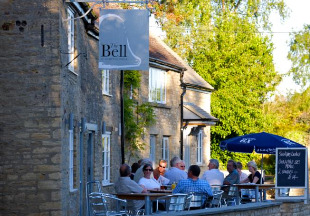 The Bell’s contemporary restaurant, with its open kitchen and wood-burning oven, specialises in pizza, fish, and shellfish. 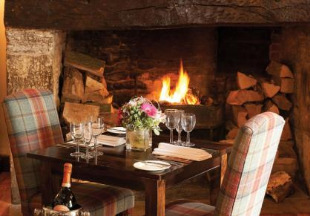 Log fires, flagstone floors, oak beams and leather armchairs sum up this classic English inn. Bicester Retail Village is a 15 minute drive away. London Oxford (Kidlington) Airport is just 10 minutes’ drive from The Bell. 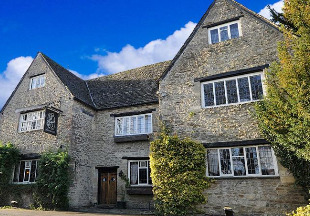 Set in 60 acres of beautiful Cotswold countryside, on the banks of the River Windrush, the Mill and Old Swan at Minster Lovell offers charming accommodation, free parking, free Wi-Fi and good leisure facilities. The Talk House is a delightful Inn, set in rural surroundings close to the historic city of Oxford. It's exposed beams and open fireplaces offer the visitor a warm and relaxed atmosphere in which to enjoy great food and Fuller's award winning beers. The ideal place to 'get away from it all' and stay in one of our four recently refurbished, ground floor, annexe bedrooms. Perfect for either business or pleasure and for exploring the beautiful county of Oxfordshire with its many places of interest. 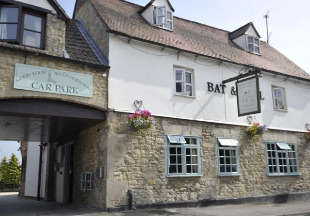 The Bat and Ball is a delightful coaching Inn with a traditional village pub style atmosphere, and themed around the ancient game of cricket! Having undergone a contemporary, yet sympathetic renovation, the hotel boasts seven unique en-suite rooms, each delightfully named after famous cricketers! Situated in the rural Oxfordshire village of Cuddesdon, the Inn benefits from being in the heart of the countryside however it is only five miles from Oxford. 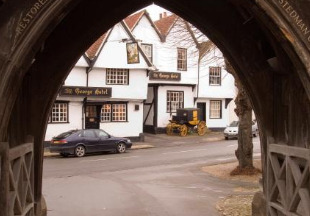 The George is a XVth century coaching inn set in the heart of Oxfordshire. Dorchester-on-Thames is central to many major centres of commerce and historic sites in Southern England. The hotel combines the beauty of an historic building, complete with oak beams and inglenook fireplaces, with all the advantages of a modern hotel. Every one of the en-suite bedrooms is uniquely decorated and offers both the business person and those travelling for pleasure every convenience. The White Hart Hotel is situated in the village of Dorchester-on-Thames, 8 miles south of Oxford. 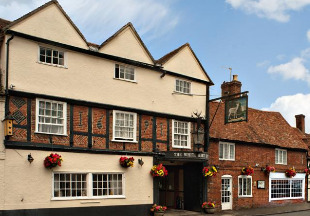 The White Hart Hotel has provided a warm welcome to travellers for over 400 years. The hotel has a superb fresh food restaurant, warm welcoming bars with log fires, resident's lounge, and 24 en-suite bedrooms including cottage suites and four poster luxury beds. No two bedrooms or suites are the same at The White Hart Hotel, where all the characters of an old coaching inn has been maintained whilst the rooms have been sympathetically refurbished. Please scroll down the page for our selection of hotels and inns in Oxford. Oxford is known as the 'City of Dreaming Spires' and is famous for its university, founded in the 12th century. The university is made up of a group of colleges, the most famous perhaps being Christ Church and Balliol. The historic centre of Oxford is small enough to explore on foot, and many of the colleges are open to the public out of term time. As well as the colleges, the city boasts several famous museums including the Ashmolean, Britain’s oldest public museum. If Oxford seems familiar, it is probably because the city has featured in many films and television series and is perhaps most closely associated with TV’s ‘Inspector Morse’. Our selection of hotels and inns in Oxford includes not only hotels in Oxford itself but also inns situated nearby in the beautiful Oxfordshire countryside. "Oxford is the perfect location for a short break. And why not treat yourself to an indulgent stay at the small and intimate Vanbrugh House Hotel. Sumptuous, eclectic and elegant yet cosy, welcoming and romantic too. There's even a secret garden for drinking and dining al fresco!"